Next is the Weathers recurve (69-lbs at my 27" draw length), shooting the 806-gr. cedar arrow. 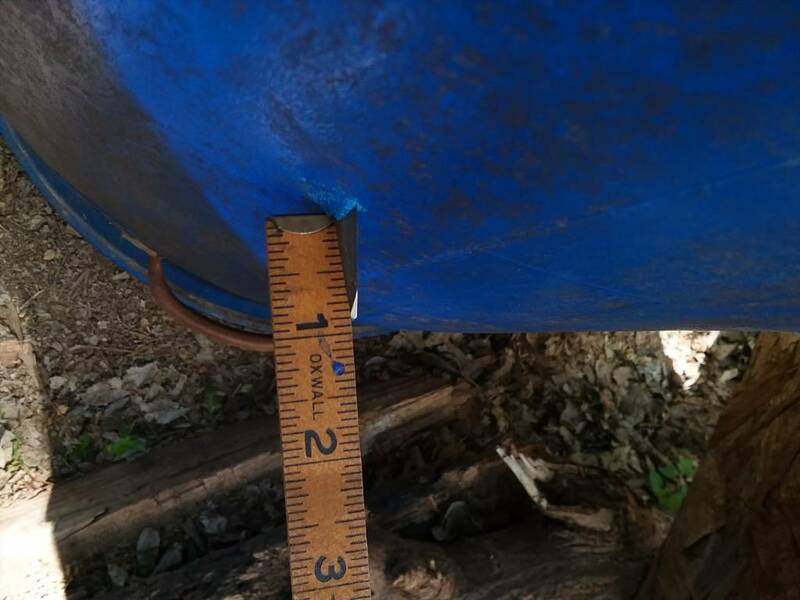 Results in 20 inches of penetration with exit from back of barrel. Last edited by tradtiger; 03-20-2018 at 03:54 PM. Here's a shot with an 11 GPP arrow. It did real well, but not quite as good as the 9.4 GPP arrows. Here's a slideshow recap of all 7 shots, so you can really get a good look, and compare them side by side. I shot each of these into the barrel three times each, with the same results every time. I shot, and tuned every arrow to shoot good from the bow, and shot enough times to know the trajectory differences. There is no positive transition from the broadheads to the shafts to impede penetration. The broadheads all make a bigger hole than the shafts are in diameter. Every broadhead was shaving sharp for each of it's shots into the barrel. I have one final test I will do when I get a chance, and that is to shoot the barrel with a 100# +/- bow, and between 9 - 10 gpp arrow weight. Wouldn't do me any good. I could only draw a 100lb bow about 3". It don't look like any of the traditional shooter "African Dangerous Game" folk are going to contribute to this with their "Big Rigs". That being the case, I decided to pull out my Old Girl, dust her off, and build a dangerous game tank of an arrow for her. 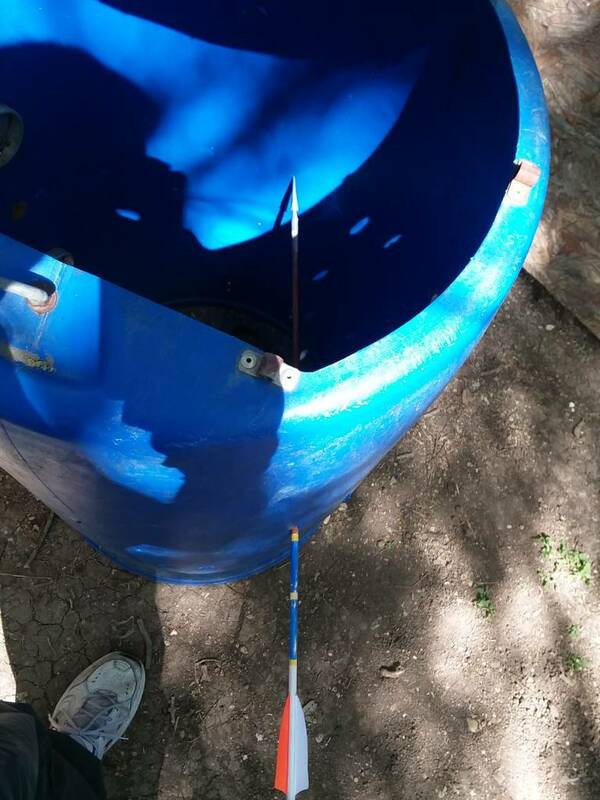 If you are getting your broadhead all the way through just one side of these barrels with your normal hunting rigs, then you should be happy, because they'll do a fine job on "ANY" North American game animals, and most likely any of the African game, that are not classified as the larger dangerous game variety. I've been all over the board with these tests. (1) Make sure your arrow weight is between 9 & 10 grains per pound of draw weight. (2) If (1) isn't enough for you - Go up in draw weight, while still maintaining between 9 & 10 grains per pound of draw weight. I may do some different testing down the road, but this pretty much covered it. If any of you want to see something else, then give it a go, and do some testing of your own. I for one will definitely be interested in seeing what you have to show. It felt good to get the old girl out, and let her do her stuff. Awesome, Rick! Authoritative thump hitting that barrel! It’s already been done! My buddy killed a giant cape buffalo this past August with his 74# recurve and 850ish grain arrows! That's not the point I'm trying to make here, and you know it. I've had a bunch of requests for chronograph speeds. Here she is with the 971gr, and a 640gr. Both are middle of three shots. Here's the 69#er with the same two arrows. Once again it's the middle of three shots. Wanna bring this thread back up to say that those Blue Wildebarrels are indeed tough, and make a great reference test for virtually any game animal. Was lucky enough to be part of a trad group hog hunt this past weekend, organized by DRT (Gary) on here (at Three Fingers Bowhunting in Fairfield, Tx). I haven't shot many hogs prior to this, but, let me just say that they are tough critters. Shot all weekend with the same rig tested above -- 70# Jay Weathers recurve, using 680-grain arrows and 300-grain Tuffhead single bevel broadheads. Believe the FOC is considered "extreme" at around 28% (but not "ultra-extreme" of 30%+). And, while I have never chrono'ed the rig, those arrows move pretty quick -- guessing at least 200 fps. I must say that, overall, I'm now a little torn over the issue of blood trail production. On the smaller hogs, the two-blade broadheads -- even with complete pass-throughs were not providing very good blood trails. Now, it could be that shot placement was not perfect, and also could be due to fattiness of the pigs clogging the wounds, but I have to wonder if a three-blade broadhead would produce a better blood trail while still getting full penetration. That said, I can't complain about the penetration and blood trail on the big piggy. Still, I think I may get some 3-blade, 300-grain 1-1/8" cut VPA's. Thoughts? Last edited by tradtiger; 05-07-2018 at 10:23 AM. You didn't get the thickest part of he shield but it was 3/8ths to 1/2" thick where you hit him. I would say you combination worked. However would a set up going faster with just that head and not quite so much foc get help or hurt? I like three blades for fixed heads. Get some and we'll go back and try them. You may have to eat up some of that pork you're going to put into the freezer first though. And you would know, alright, how thick the shield was where the arrow penetrated, since you helped remove the arrow during skinning. Thanks! Yeah, I would say it definitely did the job. So, we're risking the slippery slope of fixing something that isn't necessarily broken. I think, really we need to consider overall purpose and function of the different broadhead weights and configurations. The real reason to use a two-blade, single bevel broadhead is for its ability to actually break through bone, using a twisting action provided by the chisel-like edge, and keep going into the vitals of an animal. Hence it can provide maximum penetration in virtually any scenario. On the other hand, a three-blade broadhead provides a full third more cutting surface ability, thus, yielding a bigger wound opening and better blood trails. I think the question to consider is which problem is more pertinent to the individual game animal. In other words, if hitting bone is a more likely impediment to penetration on something like an elk, then use the two-blade single bevel. However, on a fat hog maybe hitting bone is less of an issue than providing a larger wound for blood trailing purposes -- provided you can still get adequate penetration to hit the vitals. Shooting a 70# draw weight, you should have no penetration issues with a 3-blade broadhead!!!! The bad part Friday evening was the rain and the dark. Bad blood trailing conditions. You shot through three pigs. Yes one was smaller but the ones Saturday in the dark were 100lb+ pigs. That said I think a three blade makes a better hole but when heart or main lung area gets cut into, like on you big one, it's gonna bleed out quick which always helps in recovery. I agree, and, really need look no further than Rick's test video above showing his 3-blade VPA going through both sides of the barrel, shot out of virtually the same weight bow I have. Here's a pic of the arrow, btw. About an inch was sticking out of the boar's side where it broke off on the tree when he took off. BTW, the actual specs on the front end of the arrow shown above are: 225-grains for broadhead itself, with a 75-grain adapter for screwing into the 100-grain brass insert. So, there's 400 grains altogether up-front, with a total weight of 680 grains (Warrior carbon, 400 spine). All head and no arrow! It flies good and you shoot it well Ellis but those field points are hell getting out of a Rhinehart 3D pig. That arrow seems like it should be too weak from a 70# bow??? Draw length has been measured at 27 inches; Rick Barbee says that his son's drawlength is the same as mine, and said he knows that bow pulls 69 pounds at that drawlength. That said, it's possible that my actual shooting drawlength may be slightly less than that -- slightly lowering the poundage, and I cut a little off the shafts to tune them. So, all that together seems to make them work just fine for me. I will add this: for fun I shot some 340 Beman's (that I have for my heavier longbow), and they consistently hit 6 or 7 inches to the right of the spot I would look at for the 400s. How long is the arrow? Well, finally got to a point where I felt like it was time to put a broadhead onto shaft for flight. Actually tested another setup with an external aluminum footing, but I shot about 18” to the right!! (possibly a couple inches more even). Still got a lil time to play but this very well could be the setup. They fly like darts and hit where I’m looking. Easton FMJ Dangerous game 250 shafts 28 3/8” long from the bottom of the throat on the nock to the end of the shaft with a 50gr brass insert and 300gr tuffhead. The Head was sticking out just a hair under 1 1/2” on the off side. Hope you get the op to use it. Man... I'm curious to see what my Toelke (64lbs @ 33") with 675 grains and Tree sharks would do to one of these drums. I don't have a 20 yard range though, so I probably won't get around to shooting this anytime soon. Really interesting results so far. I wonder how much Broadhead sharpness effects penetration. Fascinating thread, I’ve resisted commenting as long possible cuz nothing to say that hadn’t been said.. I know Rick had stated all heads were comparable sharpness, but I think one of the most critical factors in penetration is sharpness RETENTION...agreed on a 12” thick doe it’s less critical, but on more dense game( such as boars) it is huge. The resistance ( and dulling)on that head starts immediately. This is why a high quality steel also unfortunately equates to expensive. Yes, over the years, tons of game has been shot with inexpensive soft metal heads, unfortunately no one records the pics of curled up heads. Did you test sharpness on the broadheads after removal? Thanks, TexKing, but I actually already bought some 300-grain VPA three-blades. On DL, drawing to corner of mouth, I may well be under 27", putting actual force in the neighborhood of 65 lbs, I reckon. They work okay, though, and my arms aren't fixing to grow. For fun and out of curiosity I just took a few shots each with my regular 400 spine 680-grain, 31-1/2" arrow and a 340 spine 630-grain, 29-1/2" arrow. Hard to discern a difference in flight and hit within a couple of inches of each other. Pic shows shots from 15 yards. 400 hit spot, 340 a little lower and right.